The days are growing progressively short and the pleasantly brisk sweater weather harbors the threat of a brutish winter ahead. But: there’s a shiny silver lining! It’s quince season! If you’re very lucky, you have quince trees growing in your garden. If you’re not that lucky but still occasionally caressed and fondled by lady luck, there is a boy who volunteers to send you all the quinces from his quince tree. (Now, isn’t that a charming gesture of woo!) If you’re somewhat lucky, you can either find quinces in one of your local markets or else you can surreptitiously forage some from here and yonder. And if none of these apply, well, let’s face it, you’re entirely out of luck! At least when it comes to quinces. And that is a fate I would not wish for you, because I love quinces and I’m equally fond of you. A decade ago, pomegranates were obscure objects of desire but by now everyone is appraised of their charm and eager to heap praise on the ruby-red-jeweled fruit. Quince — an ugly fruit with a heavenly scent and a multitude of hidden charm — is for certain destined for an equal if less glittery future of popular recognition. If you have not yet jumped on the quince bandwagon, do it! Do it now! Do it before it is commonplace and mundane. 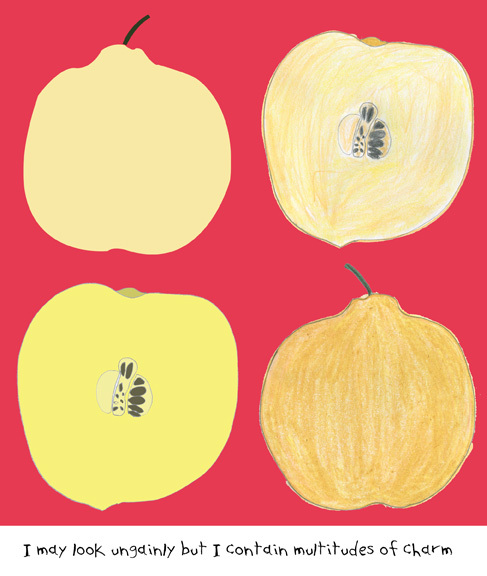 Now, as befits a Persian food blog bearing the monicker of Fig & Quince, we have covered recipes for: stuffed quince (dolme ‘ye beh); quince kookoo (kookoo ‘ye beh); quince tas kabob (a finger licking slow-cooked fusion of many delicious things that has to be tried and marvelled at) and we were also graced by Maria’s Dulce de Mebrillo Sweet Quince guest post. By and by, delicious plans are afoot to bring you the recipes for the Persian quince stew (khoresht ‘e beh) and also for quince sharbat (sharbat ‘e beh) as well. But right now, that is at this very moment in time, when our beautiful silvery moon in the sky is in its waxing gibbous phase, it’s time to share with you the recipe for quince jam (moraba ‘ye beh.) A toothsome affair that goes mighty nicely with tea and buttered bread. A little aside: I regret a few things about my trip to Iran. Regrets not too few to mention. Like: why did I not go up hiking on the mountains in Tehran more often ? Why did I not motivate and go visit my friend at her mother’s house that one time? (I really should have.) Why didn’t I make the time to go visit Joobin at Khoosh Nevissan cafe? Why didn’t I spend at least one whole day sitting in a cross town bus traversing this side to that side of Tehran? Why didn’t I take a Persian shirini making class? And why oh why oh why oh why did I not indulge in the traditional Persian breakfast? For while I did allow myself to take great and even at times greedy pleasure in the plentiful goodness of the delicious Persian food (homemade and otherwise) widely available to me when in Iran, I stuck to my old boring albeit healthy breakfast throughout the trip. Yes! I do so confess! So even as my sundry Persian guest hosts broke their fast with excruciatingly soft and recklessly sweet smelling Persian bread freshly delivered or bought from the local noonvayee — lovely bread like nooneh sangak or barbari or lavash — that they wantonly buttered and then jam’d with spoonfuls of moraba (jam) and took big bites in between sips of hot tea, I in turn had my plain bowl of yogurt with sliced banana and some chopped walnuts and their quizzical looks of concern and pity! Yes, I was virtuous, but at what price! What folly was this! Tssk tssk! It’s not possible to turn back the clock, alas, nor as of yet is it possible to replicate the amazing freshly baked bread of Iran outside of the borders of “the most charming country in the world,” but at least the moraba (jam) is one that can be remade to redress and remedy regretful neglects, and it’s specially nice when it is made with quince and I urge you to consider making it as well. The quince moraba comes out a little soft, a little chewy, and a lot tasty. Wash, dry, peel and quarter quinces. Remove seeds and cores. Slice each quarter into orange-slice-sized wedges. Squeeze a lemon over the wedges – the lemon juice prevents quince from discoloration. Place quince wedges in a pot with enough filtered water to cover 1/2 inch. Bring to a boil over high heat. Immediately reduce heat to low, close lid, and simmer for 15 minutes. Add sugar, cardamom seeds (or cinnamon stick), stir with a wooden spoon to mix, close lid and simmer for 2-3 hours — until quince wedges turn a beautiful reddish color and the syrup thickens. Fill sterilized jars with quince jam. Store in a cool, dark place until use. Notes & trouble-shooting: Do not remove the lid while the jam is being made. If the jam is not thickened sufficiently, remedy the issue boiling the mixture on high heat (without the lid) for a few minutes until the syrup sufficiently thickens. Make it, enjoy it, and noosheh jaan! I love this! You’re making me want to go out and find sangak and some beh right now! I totally agree – what a beguiling fruit – mealy and unsuspecting until you cook it either as jam or stew and it transforms into something magical. Love your illustrations as always! From mealy to magical: you put it so wonderfully Ahu joon & thank you for lovely feedback! ahh!!! so good, this is like the moraba of my childhood. My maman joon always had this with lavash and kareh har rooz sobh barayeh sobaneh. Afarin! Love this too, I have never had quince jam but I do agree about the virtues and delicious flavor of the quince and can well imagine just how wonderful this jam is with some warm fresh bread and good butter. Now I want some. I like your tip for testing for set. I shall try that next time. Quinces will soon be available here. I know you do quinces justice, Maria. I think you’ll enjoy this recipe. I am new to your post, found you through Iran Sara’s page, where I do my shopping for persian spices, yogurt and such. Thankyou for this wonderful post and so happy to see the old recipes and ones I never tried here. I bought the book by the lady who teaches classes in Georgetown, whose title is nosh e jan. Found her at Noh Rooz festival in Reston last spring. Also Iran Sara has a few copies. I thought the photos were beautiful in that book. I must admit this is much more fun! Hi Jean! Welcome and I’m delighted that you browsed and found some recipes (new and old) to your liking! If there’s any recipe you are interested in, I would be happily open to suggestions. And guess what? I actually met that lady who gives the classes (Ms. Batmanglij) the other day (while I’m here in the DC area) and agree that her books are beautiful Persian cookbooks. So has IranSara linked to this blog? I didn’t know. That’s nice! Wonderful recipe for a wonderfully delicious and underrated fruit! Your morba looks amazing! I am going to try it asap. One question: does it matter what kind of pot the jam is made in. I have made apple and strawberries jams only, and both in enameled pots (based on old saying). In your experience, is the pot’s made and material really a factor? Thanks in advance. Afsaneh joon, I don’t have white copper pots (mes’eh seffid) which are supposed to be the best and have similarly heard that enameled pots are the next best thing … all the old style Persian cookbooks and experienced Iranian cooks do seem to stress that the quality of pots do matter. but between you and me, I often use regular Teflon pots (just none that are worn out or have any nicks) and they seem to do the trick. 🙂 Hope this helps! I’m so happy that quince season has arrived. I made quince jam for the first time last year, harvested from the same tree my grandparents picked from. 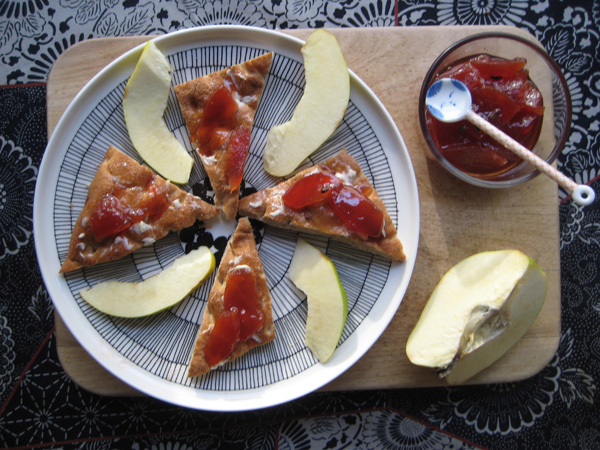 Quince jam was my grandpa’s favorite (and in fact the only thing he wanted to eat during the last weeks of his life…well, quince jam and kit kat bars). No one had made any jam since he died 14 years ago. I have now revived the tradition and will make a batch every fall from now on! 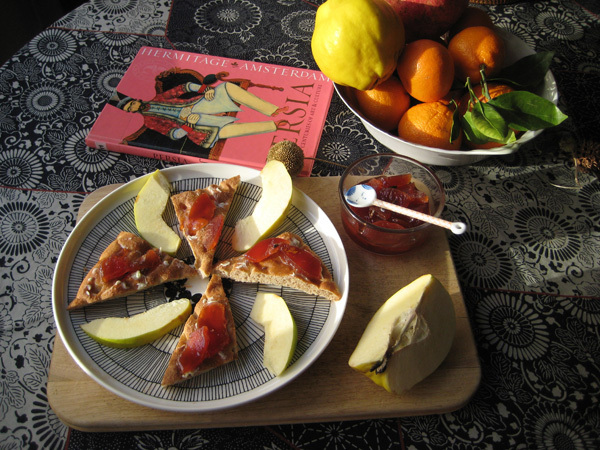 I will have to try this version, with the quince still in slice-form. Yum, thanks for this AWESOME post! Oh Andrea, what a touching and poignant story! I literally went ‘awww’ and may your lovely grandfather rest in peace. Quince jam and kit kats! Hmmm. Not a bad diet as one prepares to take leave of this earthly domain. Thank you so much for your sweet reply! Quince really has taken ahold of my heart, though as a child I don’t really have a memory of eating it. Only in adulthood, and years after grandpa’s death, has it become intensely interesting to me. I’m lucky to have access to that tree! It’s on my uncle’s property (along with his dozens of pear and apple trees), and he lets me take whatever I want. I’m forever grateful for that. Re how I make the jam; I’m still experimenting with my own recipe and spices, as the recipe grandma and grandpa used is long lost. But, before I do anything I core the quince and shred it, rather than slice it. Wow, apple and pear and quince trees! How lucky!!! Andrea, I hope you will post your quince recipe on your blog sometime. Another lovely post from a lovely lady. I love quince. I was just flirting w the pile at the grocery store yday, but refrained from getting some as our fridge was already bursting w food. Coco, you could always put them in a fruit bowl (until you find room in the fridge) because they keep rather well and also release a very nice aroma in the bargain! Quinces have been top of the pops in autumn here for a decade or more, they are now easy to find and cheap to buy. We make a similar preserve but serve it with very sharp cheese. Nest time Azita, I’m adding cardamom. lovely post, Azita. My beloved mother in law, used to make Quince-khoresh, oh that was so good. Don’t you have Persian stores in your hood?? I have never seen a quince around here, but if I do I’m going to grab it and try this out! This looks so good. I love quinces! But as you said, they’re more and more difficult to find. I made a membrillo last year and I had to search far and wide. This looks like such a wonderful snack. Love it love it love it & even more. Hi Azita joon. Really, how could you not? Persian breakfast had always been one of my most favorite of all meals specially in the khak-e paak-e vatan.. So I promise you when I go there (hopefully) will eat more on your behalf. Would that be fair?? I know perhaps not. Beautiful post. Reminded me that it was around this time last year that I got to know you through your blog. Pleased to know you a little. Have a great week & happy blogging. Be salamati – ye along good life & a long distance friendship. Delicious Azita! I tried making this with the quince I procured but didn’t look as nice as yours. Practice practice for me…. 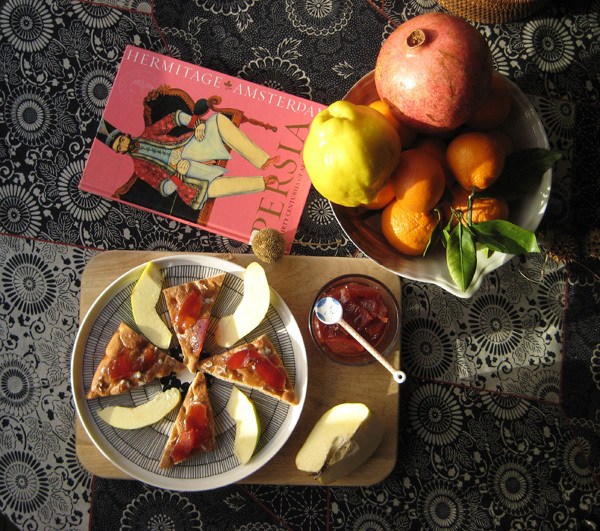 I made your delightful quince jam & my husband Peter thanks you a bunch!